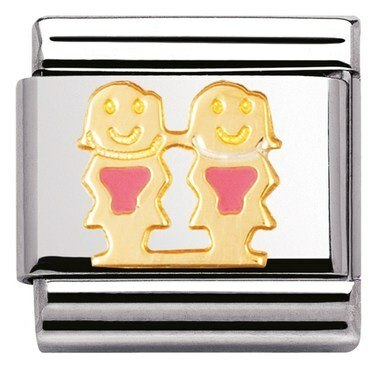 Imbued with family love, this stainless charm features two girls-symbolising sisterhood. This charm would make a fantastic gift for a wonderful sister to cherish on their Nomination bracelet forever. Ordered a charm as a gift quite close to Christmas and didn't think it would arrive on time but it did. Thank you for your prompt service. Very pleased - product excellent quality and delivered on time and as described. My sister was very happy to receive this gift. Delighted with this lovely charm and also the speedy delivery , highly recommended . Bought as a gift for a special birthday. Excellent service as always. Better looking in real life. Lovely little charm.